You brought it to the point. But that bbc peace reminded me of an actual bill debated in uganda (see: http://www.msnbc.msn.com/id/26315908/#34555183 ). Seems like scapegoating’s getting kind a popular. So great you stood up against. I actually thought that this was an anti-sexism ad, you know, a “sarcastic” ad to make people outraged. We had something similar in the past – for example there were ads with pictures of various offices that had a big writing over them that said “NO FAGGOTS ALLOWED!” which was made by an organization that defends gay rights. It wasn’t a public service announcement; it was an advertisement which (according to MediaWeek) was funded by outdoor advertisers to demonstrate the power of their advertising network. Yes, that’s right, it doesn’t even have a point to make about the subject, its target is people who buy advertising. In other words, their strategy was to attract attention through deliberate hatespeech. You make an interesting point, but of course what you are really arguing is that no-one can put an alternative view to the current ‘politically correct’ agenda. That may be what you intend, but remember this: if the ‘alternative views are not permitted’ line had been held say thirty years ago, then what you consider right would not be permitted at all. The freedom to express an opinion, even if many think it is wrong, is actually very important. No, that is not what I am arguing at all. My view is that it is simply unacceptable to disparage a group of people in such a manner, perhaps especially for the purpose of making money. If the ad said that “black people make bad teachers”, or “Graham Hind is a liar”, would this still be just an “alternative view”? Freedom of speech is not so black and white. It is very easy to dismiss something like this when it is not aimed at you personally, and virtually never is because you’re a member of a privileged class. I do find it very annoying when people (and organisations) make statements / show images/posters which are deliberately aggressive and offensive and then cover up their marketing (and in some cases their actual view) by using the “we wanted to have a debate” line. I’m all for debate around the status-quo but I prefer it when people actualy believe what they are saying and are not just using it as an excuse to offend/advertise. In my view, it’s reprehensible regardless of whether they acknowledge the statement as their point of view. There is no way to know whether someone involved with the advert had misogynist motives or beliefs, conscious or unconscious. The effect of the communication is what counts, not the intent. 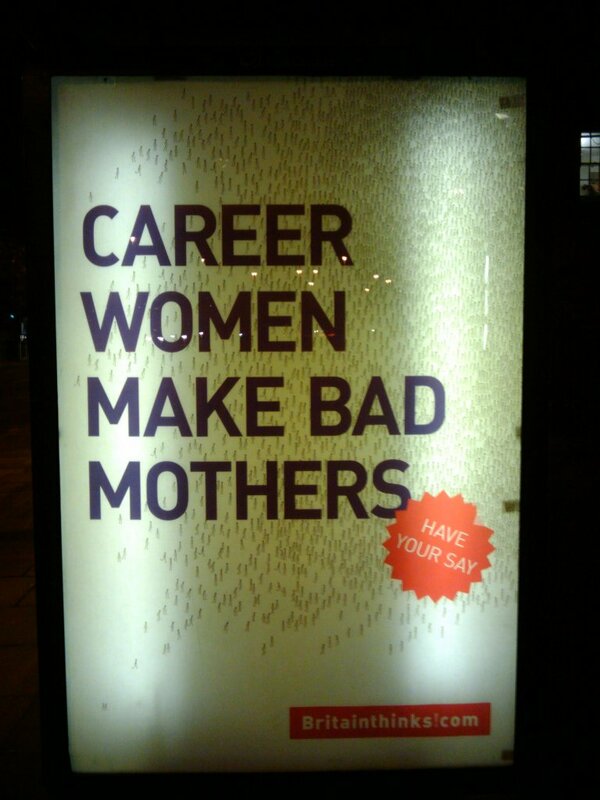 In this case, the effect is that thousands of people walking home from their jobs see this message. Some thousands of people go to work on that block. Put yourself in the position of a working mother, or a working woman who is considering motherhood, who is leaving the office after a long work week, and is met with this sign on their way home. How would it feel to have your personal life and identity “debated” this way? of course, I possibly wasn’t clear that when I say “debate around the status-quo” I don’t mean random posters in the street pointing to a website, I assume a sensible grown up discusion where people decide to get involved and realise that aggressive statements like the above don’t actually achieve anything. I agree totally – a horrible message to walk home through! I have been a working mother for most of my adult life. I would have loved to stay home – working is always a choice but sometimes not so much so if there isn’t another wage earner prepared to carry the can. This debate has been being waged for the past couple of decades – it is ignorant and boring. Incredibly hurtful at times also for those of us doing our best to ensure our children have the emotional and physical needs they require to be ok in our families and society. I appreciate you noting it Matt and standing up to any comments that berate those doing what they need to do when they need to do it. I’m a major advocate for human rights including freedom of speech – just not an imposition on the lives of people doing their best day to day by their loved ones. Actually… The advert made perfect sense, and judging by these comments has set people thinking. In that respect the advert is spot on. I imagine the complainers are the people who don’t read the small (or in this case the white on red lettering next to the main statement) print. “People are getting too damned sensitive”. That should be their next advertising campaign slogan. It seems like you’re saying that it intended to get people thinking, and it did that, and therefore it is OK. However, it did not just “set people thinking”: it invited a majority group to make a judgement about whether a minority group has the right to live their lives as they choose. What kind of “debate” is that? It is easy to dismiss someone whose rights have been violated as “oversensitive” when you have never been on the receiving end of this kind of discrimination, and indeed probably never need to imagine that you will be. It requires an active effort to identify with them and understand what is happening. The second time I saw this billboard, I was walking with my partner, and she was infuriated by it. This anger is a natural reaction to being disregarded in this way, having your rights become the subject of a money-making public “debate”. Sadly, they call it democracy. It’s why so much in the UK is/was taboo. Mat, thanks for writing about this and bringing it to light. Mind boggling how someone thought this was in any way appropriate or a good idea to go with. Boggles! It is simply a fact that most Britons will feel that the claim in the billboard is false. And it is quite ridiculous to suggest that it will somehow increase prejudice towards women in any way. The problem has always been the views of the minority of people who are prejudiced against women in this way. So how will you get the few people who do hold such prejudiced views to change their minds? By censoring them out of existence? The way to deal with such people is to challenge their views in the open and to engage them in discussion, not shut off all debate with them. And where better to do that than a space where people can air their views openly, the internet? What you seem to want is a closed-off society where public space is stripped of any controversial elements. Maybe in America you like this politically-correct culture, but this sort of authoritarianism makes me sick. If you feel uncomfortable with the billboard, I think you have a problem living in a democratic society. So grow up, Matt. And while you’re at it, why don’t you have a little more faith in the British people and the whole of humanity. No, that is not my position at all. See my earlier comment in response to a similar misstatement. I do not advocate “a closed-off society where public space is stripped of any controversial elements”. Which part of my post gave you that impression? Neither do I advocate a society where any and all behavior is acceptable. A well functioning society requires limits, and beyond a certain scale of population, these limits must be formalized (i.e. laws). Like most people, I think a healthy society lies somewhere in the middle of this continuum. As for the website, if you have a look, you’ll see that there is actually no discussion capability at all. The entire affair was designed to attract attention, not to facilitate debate (though I would not have supported this method in that case either). If someone objected to racist propaganda being displayed at their place of work, would you dismiss them as undemocratic, etc. as well? Consider whether you would feel the same way if you were someone with a bit less social privilege. Amondo is right – ‘career women make bad mothers’ is an opinion which anyone has the right to hold and to express – you either believe in freedom of speech, or you don’t – you can’t start adding caveats that it is only ok to express your opinion if your motives for doing so are acceptable to me. I also don’t know how you can assert that the people who disagree with you here come from ‘priviliged’ class.